The former Victoria University of Manchester, now the University of Manchester, was founded in 1851 as Owens College. In 1880, the college joined the federal Victoria University, gaining an independent university charter in 1904 as the Victoria University of Manchester after the collapse of the federal university. On 1 October 2004, the Victoria University of Manchester merged with the University of Manchester Institute of Science and Technology (UMIST) to form a new, larger entity, and the new university was named The University of Manchester. Owens College became the first affiliate college of the federal Victoria University in 1880. In 1884, University College Liverpool also joined the Victoria University, followed in 1887 by the Yorkshire College in Leeds. In 1903 University College Liverpool left the Victoria University to become the independent University of Liverpool; Leeds followed in 1904 to become the University of Leeds. The new Victoria University of Manchester was established by royal charter on 15 July 1903; the university and Owens College were merged by Act of Parliament on 24 June 1904. The precinct centre was demolished in August 2015 as part of Manchester University's £50m redevelopment of Manchester Business School. On 5 March 2003 it was announced that the university was to merge with UMIST on 1 October 2004, to form the largest conventional university in the UK, the University of Manchester, following which the Victoria University of Manchester and UMIST would cease to exist. The new university was inaugurated on 1 October 2004. The university had more than 18,000 full-time students (including 2500 international students from more than 120 countries) by the time it merged with UMIST. It was regarded as one of the top universities in the country, frequently achieving top ratings for research. The chief officers of the university were the vice-chancellor, the registrar, the bursar and the librarian. In later years many administrative changes were made that increased the independence of the Director of Estates and Services, the Director of the Manchester Computing Centre, and eventually combined the offices of registrar and bursar as that of registrar and secretary, the last holder of this post was Eddie Newcomb (1995–2004). Since the later 1800s many notable people have worked and studied at the Victoria University of Manchester as, for example, Benedict Cumberbatch. The motto of the university was Arduus ad solem, meaning "striving towards the sun". It is a metaphor for aspiring to enlightenment. It is quoted from Virgil's Aeneid, Book II, and the archives do not record the reasons for its choice. The original verse refers to a serpent and the sun, both of which featured in the university coat of arms. The serpent is traditionally associated with wisdom. The arms were granted in October 1871 to Owens College while the Victoria University had arms of its own which fell into abeyance from 1904 upon the merger of the College with the University. According to Norman Marlow (A. N. Marlow, Senior Lecturer in Latin, Department of Classics at the university in the 1960s), the motto Arduus ad solem – taken from Aeneid II – was a play on words, relating to Manchester's geographical situation. 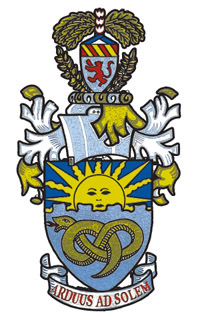 The Virgilian context referred to Pyrrhus, appearing in shining armour 'like a snake which has sloughed its skin, reaching upwards with an effort towards the sun'; the motto was chosen by the Professor of Latin at the time (Augustus Wilkins) and the coat of arms was applied for – suggesting both the idea of the institution striving towards excellence, and the city (with its particularly high annual rainfall) 'reaching upwards with difficulty towards the sun'. The emblem of the university in use for a number of years (last used September 2004) was based on the archway into the quadrangle from Oxford Road where there used to be a set of coats of arms relating to the history of the component colleges on the gates. ^ Both buildings still exist: the Quay Street house has been adapted to many purposes, recently as offices for solicitors. The college building by Waterhouse is described in the article on the University of Manchester. ^ There were also shops at ground level and first floor level and in the early years there was a branch public library. ^ 12 March 1851 is the opening date of Owens College; the Victoria University received a royal charter 20 April 1880; a royal charter of 15 July 1903 created the Victoria University of Manchester (and abolished the pre-existing University); University and College were merged by Act of Parliament 24 June 1904. Charlton, H. B. (1951), Portrait of a University. Manchester UP, p. 138. ^ "History of the Victoria University of Manchester". University of Manchester. Retrieved 23 February 2015. ^ H. Wilson & J. L. Womersley (1975). Manchester Education Precinct: Summary of 'A Review of the Plan 1974'. Manchester: Manchester University Press. ^ "Oxford Road bridge meets its demise: Photos as Manchester University's 'iconic' bridge is torn down". Manchester Evening News. Retrieved 20 September 2016. ^ "Vice-Chancellor's Archive". ELGAR: Electronic Gateway to Archives at Rylands. John Rylands Library. Retrieved 18 November 2016. ^ "Eddie Newcomb". AHUA Annual Conference 2009. Archived from the original on 7 March 2012. Retrieved 2 October 2010. This is a list of books about the Victoria University of Manchester and its predecessor Owens College. Wikisource has the text of the 1905 New International Encyclopedia article Owens College.